Great crested newt, Triturus cristatus - Britain’s largest and most threatened newt. Newts are amphibians, breeding in ponds during the spring and spending most of the rest of the year feeding on invertebrates in woodland, hedgerows and rough grassland. Now recovering in the UK, great crested newts disappeared from many sites across Europe, mainly as a result of pond loss and intensive agriculture. The Great Crested Newt is impressive, considerably larger than our other two native newt species, reaching up to around 17 cm in length. Warty and appearing almost black above, it has a bright orange belly with black spots. In spring the adult male develops a jagged crest along its back and tail. Outside the breeding season, the male and female great crested newt are fairly similar in appearance. Newts breed in ponds during the spring and then emerge onto land, spending the summer resting and foraging for invertebrates before hibernating through the winter. Breeding takes place during April/May. Great Crested Newts undergo an elaborate courtship routine with males displaying before female newts. After mating, females lay hundreds of individual eggs on the leaves of pond plants. Each egg is wrapped up in pond plant leaves and/or pond detritus for protection. Larvae develop over summer to emerge in August – October, normally taking 2–4 years to reach maturity. For much of the year newts are terrestrial, ranging a considerable distance from breeding sites. They are mainly active at night and feed on invertebrates. In the winter they partially hibernate, emerging in February or March. Great Crested Newts spend the winter sheltering under rocks, in compost heaps or buried down in mud. Great Crested Newt mitigation guidelines' targeted at developers and others involved in land-use changes. What we want to do…. Raise awareness of the need to conserve the Great Crested Newt and other amphibians and ways to do this. Survey and monitor all known Great Crested Newt sites and survey potential new locations across Barnsley. Ensure important Great Crested Newt sites are protected through designation as Local Wildlife Sites. The site boundaries should contain appropriate terrestrial habitat requirements. Encourage the production of management plans for all Great Crested Newt sites. Create areas for potential expansion of Great Crested Newt habitat. Maintain the existing Great Crested Newt breeding population. Increase both Great Crested Newt population size and range. Great Crested Newts and other amphibians benefit from wetland creation schemes and from the creation and restoration of farm ponds under schemes such as the Countryside Stewardship Scheme. Surveys have identified a few new breeding ponds and other water bodies including parts of Barnsley canal. Work has taken place to maintain Keepers Pond at Stainborough Park in positive management. Promote maintenance and development of appropriate habitats for great crested newts where possible. Great Crested Newt is is a Priority Species in the 2007 UK Biodiversity Action Plan. It is a species of principal importance under Section 41 of the NERC Act (2006). As such it remains a current national priority species. 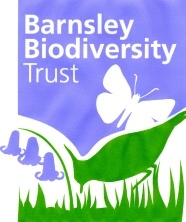 It is a local priority species for Barnsley because of its national status and because there are sites in Barnsley with good populations and these deserve conservation management. The Great Crested Newt is strictly protected by British and European law which makes it an offence to: kill, injure, capture or disturb them; damage or destroy their habitat; and to possess, sell or trade. This law refers to all great crested newt life stages, including eggs. The Great Crested Newt is listed on Annexes III and IV of the EC Habitats Directive and Appendix III of the Bern Convention. It is protected under Schedule 2 of the Conservation (Natural Habitats etc) regulations 1994 (regulation 38) and Schedule 5 of the Wildlife and Countryside Act, 1981. As a Section 41 species under the NERC Act (2006), Great Crested Newt needs to be taken into consideration by any public body in managing their estate. Declines in Great Crested Newt numbers have been mainly due to the loss of breeding ponds, reduction in breeding pond suitability (notably through shading and fish introduction) and fragmentation of habitats. Intensification of agriculture has resulted in many farm ponds becoming redundant, leading to neglect, and less suitable surrounding habitats. Many new ponds that would otherwise be suitable for the Great Crested Newt are stocked with fish, which predate on both eggs and larvae. Ponds that survive in agricultural land often become polluted with pesticides and fertilisers. Great Crested Newt can be found in a range of habitats where there are ponds, including farmland, rough grass, woodland, scrub and hedgerows, quarries, and industrial sites. It is absent or rare in upland areas, and where there are few ponds and appropriate surrounding habitats. Newts need shallow edged, medium sized, ponds, with abundant vegetation and no fish, although ditches and other water bodies may be used. Occasionally they use garden ponds. Great Crested Newts need larger and deeper ponds than most other UK amphibians. For much of the year they live out of water and then they require rough grassland, hedgerow or woodland to hunt, take refuge from predators, and over-winter. Winter hibernation is usually in old walls, under log-piles or in holes in bankings. We are interested in hearing about sightings of newts, wherever they are. We would like to hear about their breeding ponds and the areas they use for foraging, resting and hibernating. The Amphibian and Reptile Conservation group (ARC) encourages people who have newts in their ponds and on their land to have surveys done by people with a licence. Such surveys and mitigating actions are a requirement when development is planned. An area with rough grass, piles of logs and similar hiding places, close to a pond, offers newts a shelter, a place to hibernate and an area to forage for invertebrates for food. We believe that newts are more widespread in Barnsley than is known. We are interested in hearing about sightings of newts whether in ponds or elsewhere - but take care not to disturb them. Tell us and we will pass your information on and give advice. If you suspect you have Great Crested Newts on your property, you must be careful even looking for them. If your search could disturb the actual species or where they live, even unintentionally, an offence may be committed. Only a fully trained and licensed person can carry out a proper search. Good practice. Having ponds and surrounding areas where newts and other amphibians can breed, forage for their invertebrate prey, and have cover for refuge and hibernation is essential for maintaining and expanding our newt populations. Great crested newts have benefited from strict legal protection. Habitat creation and enhanced habitat management can provide the right conditions to help the recovery of newt populations. 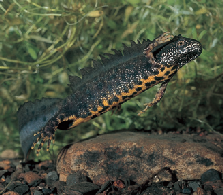 The great crested newt Triturus cristatus is widespread throughout much of England and Wales, but occurs only sparsely in south-west England, mid Wales and Scotland. It is absent from Northern Ireland. The total UK population is relatively large and is distributed over sites that vary greatly in their ecological character. One estimate has put the national population at around 400,000 animals in 18,000 breeding sites. Many of the largest populations are centred on disused mineral-extraction sites, but lowland farmland forms the majority of great crested newt habitat in the UK. Great Crested Newt has had a massive massive historic decline. Although there are signs of recent improvements, there is a continued threat from development, habitat fragmentation, fish introductions and lack of habitat management as well as pond loss. Although the great crested newt is still widespread in Britain, its numbers and distribution had a severe decline last century. They continued to decline in the last 40 years and are now uncommon. Although the species may still be found in up to around 40% of ponds in some local areas, it has been lost from many ponds, and most populations are at a reduced size and viability. Within Barnsley there are eight separate recorded sites for great crested newts although it is likely that the species is more wide spread. Further surveys would complete the picture. Breeding sites include Stainborough and Barnsley canal. However only a small proportion of sites has been recorded. Maintaining fish populations in rivers where otters have returned needs careful management until a balance is restored.